WEST LAFAYETTE, Ind. 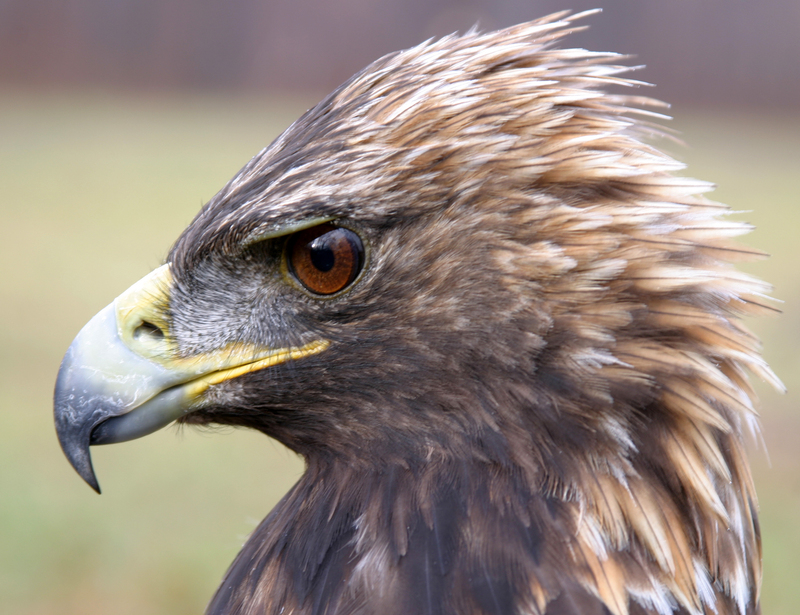 - Purdue and West Virginia University researchers are the first to sequence the genome of the golden eagle, providing a bird's-eye view of eagle features that could lead to more effective conservation strategies. Their study calls into question long-held assumptions about golden eagle vision, indicating that the raptors might not be as sensitive to ultraviolet light as previously thought. The genome also suggests that golden eagles could have a sharper sense of smell than researchers realized. Additionally, the genome provides thousands of genetic markers that will help researchers track populations and monitor eagle mortality. "Having the golden eagle genome in hand could directly affect the way we make conservation and management decisions," said Jacqueline Doyle, postdoctoral research associate and first author of the paper. Though it is one of the most widespread avian species, the golden eagle is threatened throughout much of its range by poaching, shrinking habitats and fatal collisions with wind turbines. An estimated 67 golden eagles are killed annually at a single wind farm - the Altamont Pass Wind Resource Area in central California - a heavy toll on a species that reproduces slowly and can live up to 30 years, said J. Andrew DeWoody, a Purdue professor of genetics and the study's senior author. One recently proposed method of reducing turbine-related eagle deaths was to coat wind turbines with ultraviolet-reflective paint, thereby heightening their visibility to eagles, which were thought to be sensitive to ultraviolet light. But the golden eagle genome suggests that eagle vision is rooted in the violet spectrum - like human sight - rather than the ultraviolet. "We find little genomic evidence that golden eagles are sensitive to ultraviolet light," Doyle said. "Painting wind turbines with ultraviolet-reflective paint is probably not going to prevent eagles from colliding with turbines." Analysis of the genome also revealed that golden eagles have far more genes associated with smell than previously realized, indicating that the birds might use smell to locate prey more than researchers thought. Doyle used the genome to identify thousands of genetic markers that together could act as a DNA "fingerprint," allowing researchers to distinguish individual birds, follow them in a population and determine population size and flux, parentage and genetic variation. DeWoody said the markers would also help scientists track the evolution of different families of genes and identify potential golden eagle pathogens, parasites and symbiotic organisms. The researchers generated the genome by extracting DNA from a blood sample of a golden eagle captured with a spring-loaded net in California. The eagle was outfitted with a GPS tracking device before its release, making it possibly the first animal to have its genome sequenced and be tracked at the same time, DeWoody said. Team leader Todd Katzner, a research assistant professor at West Virginia University, said the GPS device could allow the team to relate the individual movements and behavior of the golden eagle to its genome. DeWoody said the golden eagle "truly represents the wild. We want to preserve and conserve this species for future generations, and the genome will improve our ability to do that." The paper was published Wednesday (April 23) in PLOS ONE and is available at http://www.plosone.org/article/info%3Adoi%2F10.1371%2Fjournal.pone.0095599. The U.S. Bureau of Land Management, California Department of Fish and Wildlife, and Purdue University Provost's Office provided funding for the research.